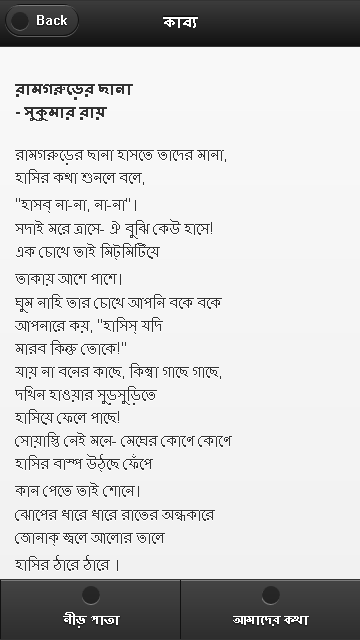 "Kabbo" is the first Bengali poem apps in Firefox Marketplace. For the last couple of months, i was working on some Firefox OS apps ideas. 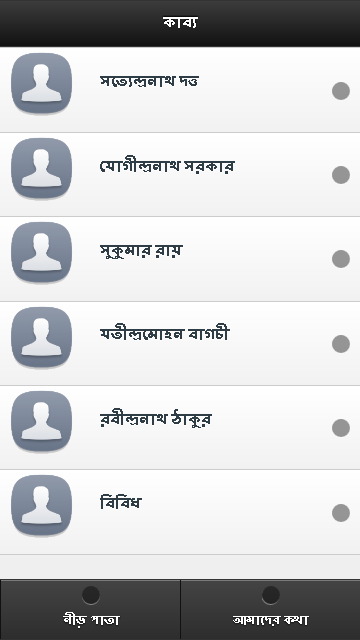 After analysis, I feel the shortage of Bengali literature based apps in Firefox Marketplace. So i engaged myself for developing "Kabbo", a collection of 100+ Bengali poems apps. This December the apps published in Firefox marketplace. Initially there are some basic features like platform independent, offline usability, compatible in all Firefox, poem search option and so on. In this version added 9 poems of Satyendranath Dutta, 5 poems of Jogindranath Sarkar, 50 poems of Sukumar Ray, 4 poems of Jatindramohan Bagchi, 24 poems of Rabindranath Tagore and 10 unsorted poems. Now based on the feedback from the users, working on the next version update of the apps.